Tripp Lite's PS-415-HG-OEM Power Strip is designed to be installed on any mobile cart, diagnostic equipment, instrument, IV pole, etc. It is designed to supply power to plug-connected components of a movable eqiupment assembly that is rack-, table- or pedestal-mounted. Features 4 output receptacles, 15-ft. AC power cord and two built-in resettable circuit breakers that control power to all outlets and protect against overloads. Switchless design prevents accidental shutoff. Optional-use keyhole mounting tabs and flanges. APPROVED FOR USE IN PATIENT-CARE AREAS WHEN PROPERLY MOUNTED: Supplies power to movable plug-connected components mounted to IV poles, mobile carts, crash carts and mobile medical workstations in operating rooms and patient-care vicinities. Ideal for operating rooms, administrative areas, patient-care areas, therapy rooms and imaging environments. 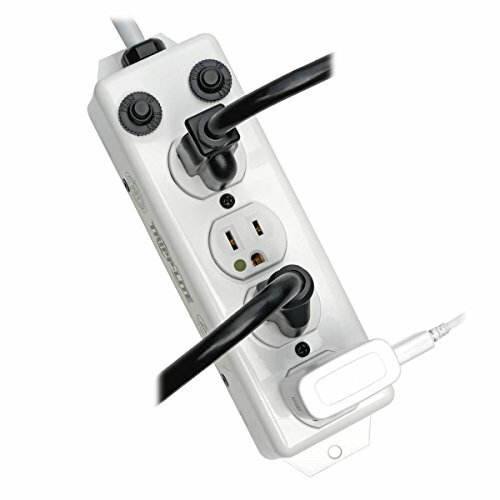 VERSATILE MEDICAL GRADE SOLUTION WITH FOUR HOSPITAL-GRADE OUTLETS & 15' CORD: 4 NEMA 5-15R-HG hospital-grade outlets provide consistent power. 15ft. power cord with NEMA 5-15P-HG hospital-grade plug provides ample reach to the power source. Metal housing. UL 1363A COMPLIANT & PREMIUM SAFETY FEATURES: Dual, resettable built-in 15A circuit breakers protect against dangerous overloads. Switchless design prevents accidental shut-off. Includes four locking outlet covers that require a tool to remove. Mountable and compliant with UL 1363A specifications. ANTI-MICROBIAL COATING - 99.9% EFFECTIVE IN INHIBITING BACTERIA AND VIRUSES: Silver ionic powder coating is 99.9% effective in inhibiting the growth of bacteria like C. diff and MRSA. Patented coating helps to reduce the risk of healthcare-acquired infections (HAIs) in hospitals and other medical environments. Coating meets the requirements of JIS Z 2801:2000, an international standard for evaluating efficacy in antimicrobial products. LIFETIME LIMITED WARRANTY: For peace of mind, this unit is backed by a lifetime warranty.